Snow flutters gently to the ground through the still air. A distant speaker plays a soft and forgotten song through an empty plaza. A pile of bodies burns in a park across the street. My carefully placed bullet pierces the fuel tank on the back of a “Cleaner,” and his screams sound as an alarm that he knows he’s only got fleeting moments left for this world. The fiery explosion brings back the quiet peace of the increasing snowfall, but I know it won’t last long. There’s another threat waiting on every block of this lawless, virus infested world. This is New York City now, and this is my life as a Division agent. I’ve had my boots — or suede shoes, rather — on the ground for 45 hours, which means I have played a lot of The Division in the five days since release. As a newly activated (and painfully silent and emotionless) second wave agent, my task is to help clean up and bring order to the quarantined streets of New York City. A virus with an exceptionally high mortality rate known only as the Green Poison has been spreading faster than officials know how to handle it. Add to that the rampant lawlessness of certain factions of civilians, and you’ve got a boiling pot of disaster located within just a handful of square miles that threatens the future of the entire human race. A boiling pot of its own, The Division aptly combines elements of many other games while managing to retain an identity for itself. I’ve seen the Destiny comparison come up a lot, and I’ve even made it myself in regards to the beta, but the more I play, the more I distance it from that correlation. I find more similarities with games like Diablo III, XCOM: Enemy Unknown, The Elder Scrolls Online, or even Borderlands than I do with Bungie’s shooter. The Division blends the familiarity of cover based third-person shooters with a deep and intricate MMO styling, complete with class customization, loot drops, and level ups. Better yet, it does so in such a way that alienates neither group, but makes the game accessible to play no matter which side you’re coming in from. If it leans more towards one side than the other, I would say that there are certain MMO elements about it that I took for granted which more casual players may never pick up on. The solid cover shooter base helps make this a non-issue though. Don’t expect to make headshots and get one-hit kills. Sure, it will be doing critical damage, and aiming means far more in this than in something without traditional aiming mechanics like Diablo or XCOM, but there is a certain tactical level that each player must approach The Division with. Enemy health will drop similar to Borderlands, with numbers indicating precise damage being done to the health bar. It takes some getting used to, but ultimately makes the game really focus on communication and group combat, which comfortably scales to manageable but difficult levels as you add more people. Some of the best moments I had in The Division were times when I was in a group taking on missions that were far too hard for us, and yet we deftly overcame the challenge. Unfortunately for those who want things on the simpler side, the weapon menu is a mess to navigate. Trying to determine which weapons to keep, mod, or discard is nightmare inducing as there is no way to separate or organize them by type, so you have to figure out if that shotgun with less DPS than your SMG is worth keeping or modding based on tricky information. Haven’t managed your inventory in a while? Good luck. You’ll probably throw something out you meant to keep. And yet, there’s an entirely separate section for weapon mods which I can’t actually equip from that menu. It could do with some serious tweaking. 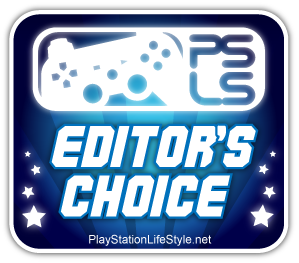 Cover based shooter fans, those first 45 hours of the game are for you. 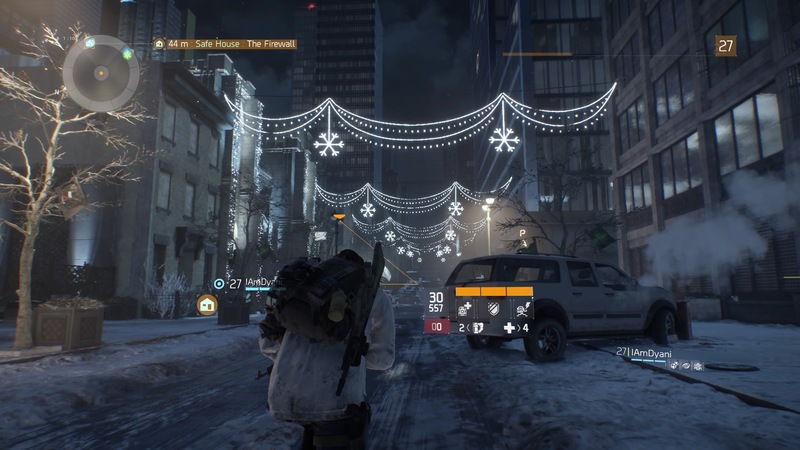 In the grind to level 30, The Division is an open world third-person shooter that you can play with friends (or strangers, or that guy doing jumping jacks in the corner of the safe house). Loot will be consistently outclassed by future drops. The map is going to drive an ADD person mad with nearly 300 collectibles, and tons of side missions and encounters to find. You will still be unlocking and discovering skills and talents. The Division as an open world cover based third-person shooter is already a full game by itself that will take in excess of 50 hours to complete if you are going for 100% completion. Then they added the end game. It’s this point that will wildly separate players. You know those people that finished the story in Diablo III then put it down? This part is not for them. The Division end game is for those people that have sunk thousands of hours into Diablo III or the Borderlands games in search of the absolute perfect loot rolls for every single one of their characters. 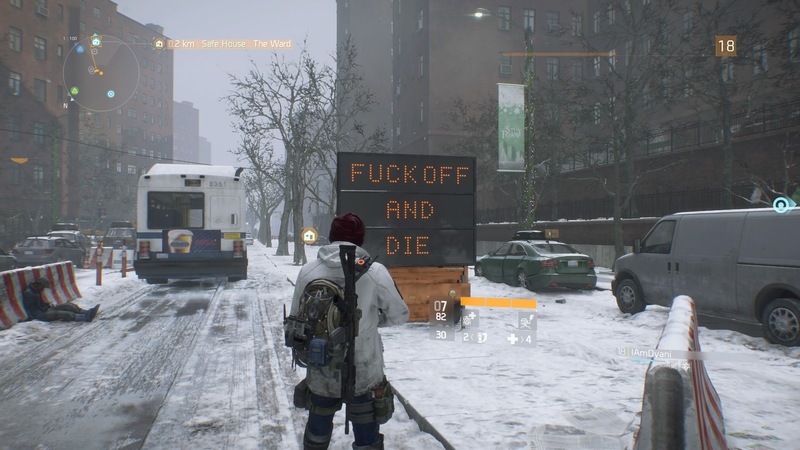 Some people will play The Division like any other open world game, completing everything they can. These players can even achieve the platinum trophy. But beyond that, there are people who will play The Division in perpetuity of something they may never actually fully achieve. When you finish the main missions and reach level 30, you can continue to play story missions on hard difficulty for more challenges and better rewards. There are also daily missions, and challenge modes to take on. 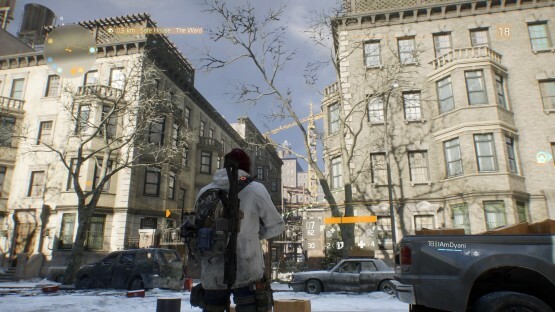 And of course that giant red area in the middle of the map known as the “Dark Zone.” Though you can technically take on the Dark Zone beginning at level 10, most players probably won’t jump into it until the end game, seeing as any loot they obtain would be quickly outclassed as they leveled up. 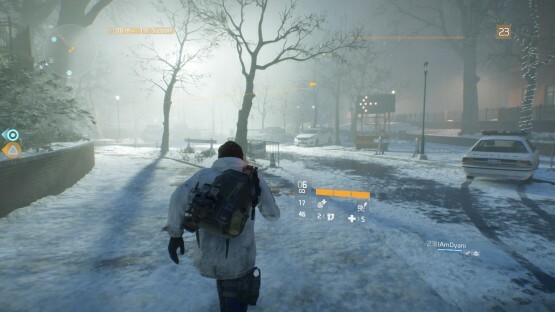 The Dark Zone is supposed to be The Division’s PvP area, where players compete against one another for above average loot. Agents who attack other players can steal their loot and extract it for themselves, but are considered rogue, and when dying in this state, the penalties are severe. It’s this reason, combined with the relatively unimpressive loot drops, that you will hardly see any players actually fighting each other in the Dark Zone. 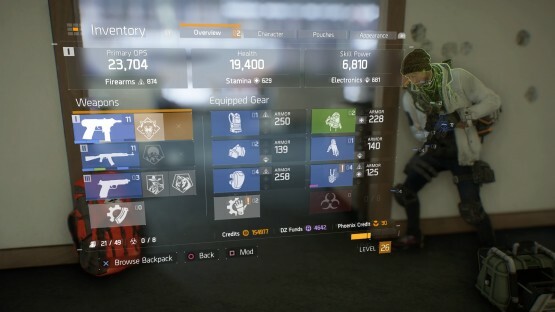 Its not worth it to go rogue for high risk and mediocre rewards, so the Dark Zone becomes little more than a place where players team up with random other groups to take on hoards of slightly more difficult enemies for some okay loot that probably won’t outclass the things that you can craft yourself at the base. While the initial offering of The Division is impressively full featured for an MMO, the end game feels incomplete. I know that DLC and updates will be expanding this aspect in the coming months, but I can’t help but feel that there’s really not much to strive for once the final mission has been played. It does feel a little unfair though, to critique something only after I’ve spent almost 50 hours thoroughly enjoying it. While the end game may be lacking, nearly everything leading up to that moment is done incredibly well. It’s graphically stunning and detailed (the Snowdrop engine is awesome). The missions are lengthy, fun, and change dynamically based on your group numbers and the skill builds of each player. It’s simple to respec your class if you want to change how you play. It’s also got a bleak world fleshed out through recordings and logs around the city. How great the initial game is perhaps makes it all the more disappointing there’s not a bigger challenge and reward in the end. At the end of the day, when The Division starts showing flaws, aside from minor design issues that I can grouse and grumble about, I have already played it five times longer than the entire length of other games. I don’t want to make excuses for the developers and say that it’s okay to add in content later to make it feel complete, but as full featured and fairly polished as the base experience is, it’s an issue of me wanting more, rather than an issue of the developers leaving much out. The Division is something special that’s never really been done before in games, and while I don’t expect perfection from such a bold experiment, I’m impressed with what they have been able to pull off so far. We’re just one week post-pandemic. Imagine what’s in store for us going forward. Tom Clancy’s The Division review copy provided by publisher. For more information on scoring, please read our Review Policy here.